Beets remind me of my grandmother and Shabbat. Spending Friday night with her was a special treat and I loved it. 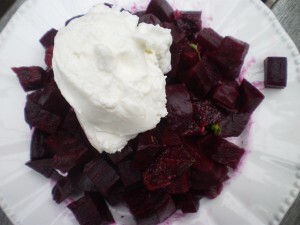 We would always start with cold Manischewitz borscht with sour cream, then clear our plates for dinner. As I child, I liked the creaminess of the sour cream and the tart and sweet taste of the beets, but most of all I loved the way you could make the borscht turn a beautiful shade of pinkish purple when you combined the two. I still love beets as anyone who has ever shared a Shabbat meal at our house knows, but usually it is some form of freshly roasted beet salad. I hadn’t thought about modernizing a beet and sour cream dish until last week when I was trying to figure out what to have for breakfast. I have been trying to avoid cereal – a regular serving doesn’t fill me up so I eat too much of it. I also didn’t want to bother making oatmeal or my other favorite – six minute eggs. It was then I remembered I had a roasted beet and my new attempt to get more calcium – siggi’s Greek yogurt, so I decided to combine the two. 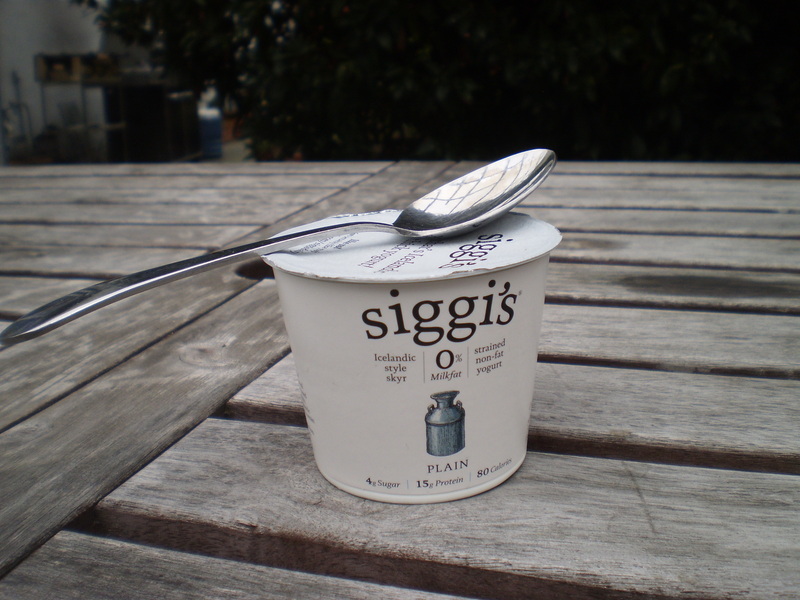 Substituting yogurt for sour cream is nothing new, though usually the taste isn’t quite the same, but the rich creaminess of Siggi’s yogurt is an exception. I like combining beets with fruits and nuts. It is blood orange season right now so I have them around as well. The taste and color of the blood orange goes great with beets. The salad really brightened my morning. 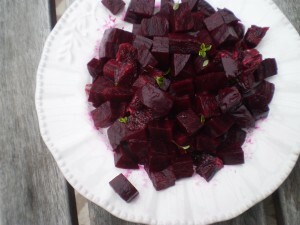 Not everyone likes beets first thing in the morning, but don’t worry, it makes a nice lunch as well or serve it on Shabbat as a salad without the yogurt. Experiment – let me know how it turns out. Cut a length of tinfoil for each beet large enough to wrap the beets separately. Spread a little olive oil on the foil, rub the beet in the olive oil until the beet is lightly coated. Sprinkle salt on the beet. I tend to be very generous with the salt since most of it is rubbed of when you remove the skin. Roast for 35 – 45 minutes until tender but not too soft. Remove beets from oven, let them cool enough to handle- but before they are completely cool, take paper towels and rub off the skin. The skin should come off rather easily. I find if I wait for the beets to be completely cool, it is harder to peel them. Dice the beets in about 1/4″ – 1/2″ dice. Put in a bowl. Slice the peel off of the blood oranges. Then slice the blood oranges in circles aand then section. I like to make the pieces about the same size of the beets. Squeeze the juice remaining on the peel into the beets. You may even want to juice one blood orange over the salad. Wash the thyme (I like lemon thyme, but you can use any herb) and remove the leaves from the stem into the salad. 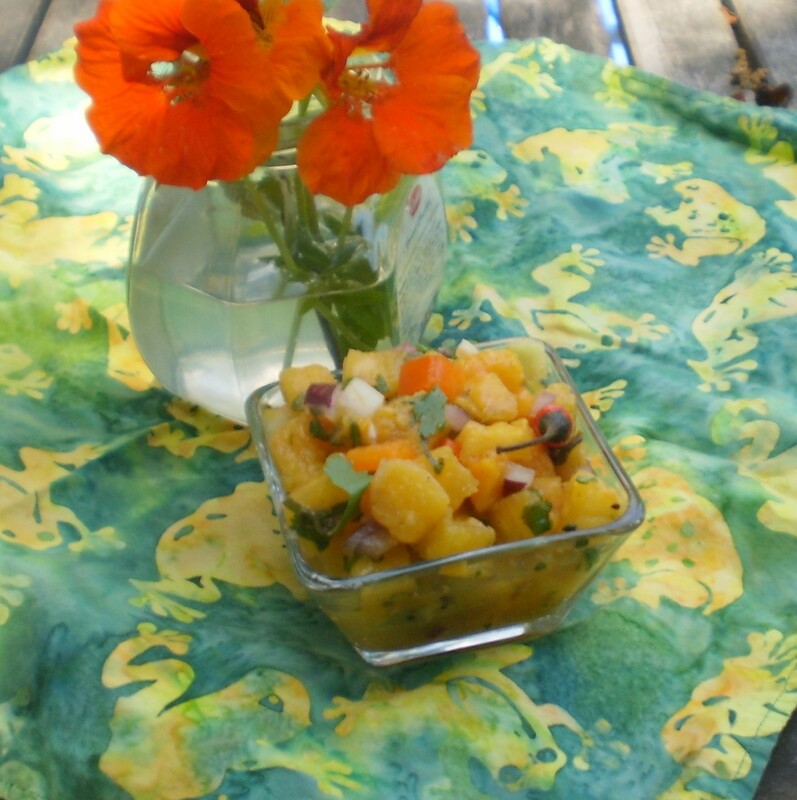 Serve with a dollop of yogurt. 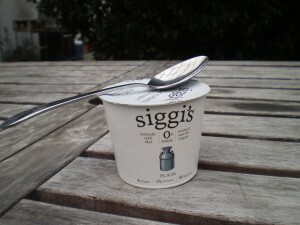 Note: I did not receive any compensation from Siggi’s yogurt (Kosher certified dairy: Orthodox Union). I like their products and like sharing good products. Copyright © 2019 Mindy Cooks.